I set myself to write about the subject ‘The Colour Circle’ a long time ago. That is because I am an artist and it is central to the way I understand, choose, and use colour. But…. First, the colour circle is not natural. The colour circle doesn’t appear in nature. That is because light happens naturally when the sun pumps out waves of energy. And visible light is part of this energy in a narrow range of wave lengths. Our eyes are geared up to see light from this smallish section of the range. We humans can see the colours that occur in the rainbow spectrum between the ultra violet and infra red wave lengths. These two limits to our vision are some way apart. However the colour wheel seems to show them next to each other. But they aren’t! Second, colour is only part of, and because of, light. Things absorb some incoming light and reflect the rest. Different colours occur because only some of the light is reflected from things. If you send a different light source onto a surface you can see a different reflected result. The colour that you see depends on the light source. So the actual surface of a thing isn’t actually the colour that we see. Colour isn’t real. Thirdly, colour is complicated because it also consists of tone, hue, and intensity. Tone is how dark or light the colour appears. Hue is where-abouts in the spectrum it is. Intensity is how pure it is or how mixed it is. The combination of these three factors means that there are actually many thousands of different colours that we humans can recognize. Some estimates say that there are actually 100 million colours. It is a big list! Fourthly, some colours are primary, some secondary, some tertiary, etc. Red, blue, and yellow are called primary colours. You cannot make these colours by mixing other colours. In between these are secondary colours are made up by mixing the two adjacent primaries. Mix red and blue and get purple or violet. Mix yellow and red to get orange. Mix blue and yellow to get green. But why is that? Why can’t you mix orange and green to get yellow? Fifthly, humans have eyes that see red, green, and blue. I have written more about this in a previous blog. Basically it is because our eyes are designed by evolution to distinguish between green leaves and red or orange fruit. We have cones in our eyes that can recognize blue light, green light, and red light. Interestingly cats have the same ability, whilst dogs can only see blue and yellow. So how do we see yellow? Finally, what and why is the colour circle? The colour circle seems to have been invented by Sir Isaac Newton in the late 1600’s. He discovered the visual spectrum by using prisms to recreate the rainbow range. ROYGBIV, or Richard Of York Gave Battle In Vain is an easy way to think about it. That is Red Orange Yellow Green Blue Indigo and Violet. Sir Isaac and another bloke called Munsell saw and understood this spectrum as analagous to the musical scale. They put letters to each colour, and saw that either ends of the spectrum were similar with similar reflective colour results. So they joined them up by making a circle. Bingo! 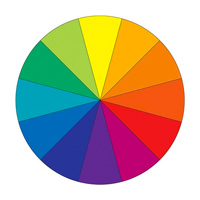 The colour circle. It is invented. Visual artists use the colour circle idea to help them understand a bit more about colour. We can use it to pick out opposite colours, also called complimentary colours. Red is opposite green for instance. These have the effect of intensifying the effect that a colour has on our vision. Use a complimentary background to make a colour zing. But the colour circle is not natural, and colour is not real, there are multi-millions of colours, mixing colours doesn’t make sense, some colours like yellow should be invisible, and Sir Isaac made it all up because he thought that it was like music. Next articleNature or Nurture the biological determinism debate.